Rode a surprisingly difficult 200K permanent (Richland-Pendleton-Richland) in Eastern Washington. Conveniently, the ride started at a Starbuck's. 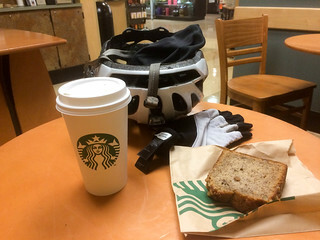 Even more conveniently, the ride from the hotel to the start was 2.3 miles -- perfect coffeeneuring distance!